The website www.RealAge.com offers a free test. They say that "Your RealAge is the biological age of your body based on over 100 factors – many that you control." I have heard this before, so it seems worth a try. The test's goal is to answer this question: are you biologically younger, older, or the same as your birthday age? Here is what they say you’ll get: (1) A personalized plan to feel younger, and (2) A list of what’s making you younger or older. I like what this test is all about, for several reasons. First, it gets you in the mindset of "I am not a number" -- that age, as defined as "years since birth," is ultimately not important. Fitness level (mental and physical) is. If nothing else, finding out that you are really years younger (in biological terms) than your chronological age should give your happiness quotient a boost. And, coincidentally, that act of feeling happier happens to help your health, too. It's win-win. I also like the RealAge site's sidebar section -- their "DID YOU KNOW..." tips. One example: "Laughing often can make your RealAge 8 years younger." Which makes me wonder: if health insurers wanted a wonderful win-win -- healthier customers, and hence lower costs over time -- wouldn't more of them proactively pay for preventive procedures? Can't creative companies cover the cost of comedy clubs? Or Comedy Central on cable? The information provided here is, to the best of our knowledge, reliable and accurate. However, while Life Alert strives to provide true, precise and consistent information, we cannot guarantee 100 percent accuracy. Readers are encouraged to gather more information before drawing conclusions and making decisions. Dr. Don Rose writes books, papers and articles on many topics, including computers, the Internet, artificial intelligence, science and technology, and issues related to seniors. 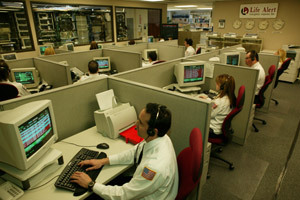 For more information on Life Alert, its emergency response services and other benefits for seniors nationwide, please visit lifealert.com , seniorprotection.com and 911seniors.com.